Since the 1950s, the American corporation Pantone has been producing series of detailed colour guides, the purpose of which are to provide a guide to help create uniform colours. Industries like printing and textiles find these particularly helpful, since they are able to use them to make sure that 2 remote factories are working to the same standards and guidelines. Another set of colours which are frequently used especially in printing operations are known as the CMYK group. CMYK refers to the 4 base colours which are used to create a variety of others. These are Cyan, Magenta, Yellow and Key Black. The range of colours which can be produced here is much narrower than the full range of Pantone colours – indeed it forms a subset within the Pantone range (and many Pantone guides contain a note beside CMYK colours). Pantone produces a greater range of ‘spot colours’ than CMYK. For the sake of clarity, a spot colour is one produced in the printing process by an ink on a single run. This is because it uses a greater number of core colours than the CMYK process – 15 (if you include black and white) compared to 4. 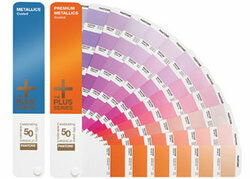 By mixing these 15 colours in specific amounts, Pantone has created a total of 1,114 recognized spot colours. Despite this, most industrial printing operations still use the CMYK process. It is generally considered that the process produces an acceptable range of colours out of the 4 core ones.